The day after Apple reported its first year-over-year decline in iPhone sales, stockholders dumped the company's shares left and right. 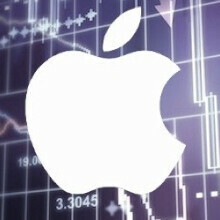 Apple's stock declined 6.3% today, falling $6.53 to $97.82. The decline wiped $40 billion off of Apple's valuation. While this might seem like a rather harsh reaction to a decline in iPhone sales that was expected, Apple also reported its first quarterly decline in revenue in 13 years. While the 51.2 million iPhones sold during Apple's fiscal second quarter actually topped the Wall Street consensus calling for sales of 50.7 million units, what wasn't expected was the $641 average sales price of each phone sold. Analysts were counting on Apple to take in $658 for each iPhone purchased. Also bothering analysts was the overall sales drop of 26% in the Greater China region, which includes Hong Kong. Apple CEO Tim Cook's reaction, "This too shall pass," indicates that Apple is considering this to be a temporary decline. And in fact, despite the drop in valuation, Apple remains the most valuable company in the world. That is partially because the second most valuable firm, Google parent Alphabet, recently saw its value drop 5% after reporting earnings. I don't know if I consider that impressive, or absolutely terrifying tbh. I'm leaning towards terrifying lol. Something find weird is that some people seem to not want to admit that Tim Cook really is a place holder and not an innovator Apple success is Steve Jobs and they don't have that any more. Tim Cook can't keep repeating every design Steve Jobs did forever, and not fall eventually. The only person showing some sign of being something innovative is Panos I mean look at the Surface Book it's made with risk and is truly something new. While Tim just keeps trying to recycle Steve Jobs work and sell at higher profit margins. Tim Cook will turn Apple into just another android manufacturer.. where its all about features that so few if any people actually use and having pointless different version of the same device. Steve Jobs wasn't an innovator either. He was so good at putting things together. But many many good things happened after Tim assumed the position. iOS sucked so bad in design, everyone complained. Look at iOS 7 which made many switch. I started liking iOS (to a point) after iOS 7. Same with Mac OSX, Before Yosemite it was a mess in design. Now its better than ever. The new Mac Pro, thats innovation. Apple doesn't update it as often, thats their cocky habit but When it launched in 2013, It turned a lot of heads. But Apple took downhill Post iOS 8 era. Everything sucked so bad. They didn't innovate but tried to rip their customers off even more. Their last good product (as advertised) was the iPad Air 2. Everything else including the 2015 15" MBP, Apple Watch, iPhone 6S, iPad Pro(s), The new MacBook sucked. Their accessories including Apple Pencil, Magic Mouse 2 and the battery case sucked too. They were either overpriced or had huge flaws. They need to innovate and stop ripping off their customers. so you're the guy that knows the future? I wouldn't exactly say it's for nothing. Seeing a drop of 10 million phones year over year in their first unprofitable quarter in over a decade is by definition abnormal. For what reason exactly do you think their sales will pick up next quarter? Objectively. I'm not saying they won't, but you do need to be realistic and look at the overall trends in the market. Apple is inevitably going to have to diversify and stop relying so heavily on smartphones for growth/sales. TerryTerius, you just said it all right there in your last sentence. Apple truly needs to diversify and stop relying so much on the iPhone. If they don't, they will only find themselves in pretty bad shape down the line. Well in my opinion, just the high probability that iPhone 7 and 7S will be newly redesigned iPhone which will most likely feauture waterproofing and other new stuff and that Apple has put more focus on a huge market like China (they have built more stores and completed deals with new carriers) and also once the iPhone 7 comes, the SE's price will probably drop a little (which will drive sales in emerging markets. e.g. India). Take all of that into account and I would say Apple will most likely have a fabulous quarter coming up! Lol.. iPhone SE is the phone not to buy in India. You can easily get iPhone 6s at MRP of iPhone SE. Apple is cruel. They earlier priced it at about $461. Next Day, they changed it to $615 launch price without any reason. Apple is not Cruel Siddharth, it is Indian Governament, Indian business personel who decide it to sell it for such high price. So dont blame apple for this. So they reduced the price of 6s to $461 dollars and when SE launched, they raised it to $615. How the hell is that the government's fault? Apple launched it for over $900 (yes, for the 16GB 6s not the plus), sales were pretty low, so they reduced it. Now they are raising it again. Let's blame the government for everything. huh? I bet you thought that too after 2014 Q1 results were reported for the iPad... Meanwhile, it looks like the big money maker (iPhones) is following the same trend as the iPad started 2 years ago. Which makes sense, because both products suffer the same issues (market saturation, mature product that warrants and thus sees longer lifecycles in the hands of consumers, more competition). I'm waiting to read the post of one PA member, and one PA member only. And I'm guessing that post will be pretty darn long. You cant stand on your own 2 feet? How about this? Market saturation isn't Apple's problem. The problem is other OEM selling iPhone's for a lower amount of money. People may not know what what GHz and other things mean, but they can see numbers. They can see phones with 1080p costing $400 while Apple is $700. They can see photos by other phones taking better pictures. They see better solutions like curved screens, water-proofing with small raise in price. And they see Apple add nothing and raise the cost $100 just because the device is a little bigger. Not everyone is as stupid as many of you guys. The iPhone 7 needs to be everything and more what they plan for the iPhone 8. If they don't, Apple is never going to recover. Either Apple puts that $200B to use, or they can join Microsoft, Nokia and Blackberry at the bottom. After all, Nokia was selling nearly 300M phones, Apple never even made it that far. See how fast they fell? If Apple doesn't do something now, they will fall FASTER. It will serve them right for trying to rip people off. And there it is lmfao :^). Bud, you have too much time on your hands. "Disconnect" please, you're only making TechieXP relevant to your life. Yeah, but Techie took the bait and replied with essay. That was funny. Apple added nothing!!! This sentence proved that there is no need to read your comments. What is important in your comments is only the size. nokia vs iphone, my personal exp. i had iphone 5s, i needed it just for business, like calls emails, i could not go thru the day with that nice looking phone, one day i was so pissed off when i needed to make important calls at the end of day but iphone was dead, i swapped it for lumia 930, it holded me more than a full work day. at that point it had 1080p, wireless charging, it had i think faster wifi etc etc. i saw latest windows phones, man they can innovate, sd cards, login with face recognition, phone connection to monitor etc etc. i have macbook which i am using now. only one advantage apple has over other companies i can name its thunderbolt and thats it. slower older tech for more price, that should be new text on apple website when we enter it. anyway i dont care brand as long as i can pick most for my money, more players on market better competition on market lower prices for better tech, apple looks like they think its monopoly. I'm not a fan of you mentioning Techie for no reason lately like he used to reply you with mostly irrelevant essays but I must that that was pretty damn funny. And him taking the bait and replying with essay literally made me laugh. +1 for that haha.